I recently spent a warm, sunny day in beautiful Benicia, CA, on the north east side of San Francisco Bay Area. Benicia is a gorgeous little town, surrounded by water on two sides, that has old Victorians, California’s oldest state capitol building, stunning views and so many interesting shops. My favorite is Studio 41, a gallery of stunning American made arts and crafts. They also carry a great selection of cards and gourmet foods as well. I always find a treasure I can’t live without. Now, knowing that I have been either exhibiting at fairs (20+ years) or attending fairs (40+ years, starting as a child with my parents) for that long, I find it amazing that it is still possible to be wowed with the variety and creativity in the artists’ works offered. I think this is due to proprietor Leah Perry-Shelhorn’s keen eye for discovering the new, the inventive and the finely-made. I find absolutely the finest crafts that are handmade in America. The gallery was actually celebrating Studio 41’s 17th anniversary (April 28) the day we stopped in. Benicia was also holding its annual Mardi Gras Festival. My cousin and I were able to watch the colorful parade go by as we sat in the Camellia Tea Room enjoying our lunch. What fun!! Once or twice a year I take the time to get together with my cousin Cyndee Ruiz when we meet at the Camellia Tea Room in Benicia for lunch. Cyndee, who is the language arts specialist at Whitehead Elementary School in Woodland, CA, is a vivacious, caring and talented elementary school teacher who just received the Teacher of the Year award for the Woodland school district. She works her magic with a challenging school population and has achieved amazing results. She is so deserving of the this award and I am so proud of her! If you have a special teacher that is making a difference in your children’s lives whom you wish to thank, please visit Unique Teacher Gifts for a variety of affordable, useful gifts that any teacher would appreciate. World Penguin Day is celebrated each year on April 25th. It is around this time that penguins begin their annual northward migration by swimming or walking (waddling) to their destination. Some penguins have been tagged with electronic satellite transmitters which found that they usually travel between 600 and 1200 miles from their breeding site! My daughter Kayden’s 2nd grade charter school class animal mascot is the penguin, so of course I gave her teacher a couple of my handy Penguin Magnet Clips to clip up the world map on the white board while pointing out Antarctica to the students. Kayden and all of her classmates created wonderful Powerpoint presentations on a variety of penguin species – from the Emperor penguins, the largest penguin with adults standing about 3 feet 7 inches tall, to the Little Blue (or Fairy) penguins, which are the smallest penguin species at around 16″ tall. As can be expected, we saw and loved the movie March of the Penguins last year. It is amazing how these birds that don’t fly have adapted to life in Antarctica! If you’re a penguin fan then be sure to visit Cool Penguin Gifts. My irises started blooming last week. I look forward to this time of year when the plain, spiky plants start coming to life and displaying a gorgeous array of artist’s colors. The striking juxtaposition of ruffled standards against magnificent falls with accents of contrasting beards excites those creative juices in me. They are such dramatic, regal flowers. Even though they bloom for such a short time each spring, I eagerly await their arrival, checking the progress of each plant, anticipating the explosion of color. These are not the instant display of color in your garden derived from planting several trays or annuals from the local nursery. I send away for my iris bulbs from Schreiner’s. Order in the spring for best selection, plant in mid to late summer, and be patient. 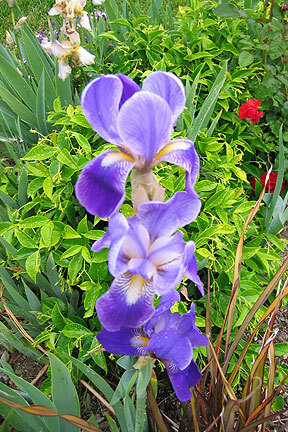 If you can’t handle delayed gratification, irises are not for you. I love my iris flowers. Can you tell? Would my tea cups, or calendars, or umbrellas give it away? Or perhaps my iris design? It is one of my earliest designs, and that is so often how it is – you design what you know and love. I’m not the only artist who loves their irises. 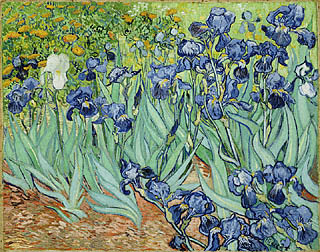 I think of Van Gogh’s Irises, which I had the opportunity to view at the Getty Museum in Santa Monica (Los Angeles) last year. The variety of shape, shadow and color is amazing. If you happen to love and collect irises as I do, then please take a moment to view my interpretations of this elegant flower on my web site at Beautiful Iris, Rose and Flower Gifts. You’ll find pretty business card cases, night lights, badge reels, earrings and more. So, you want to be an artist. How do you know you have what it takes to make a career of it? This is the fourth in a series about what it takes to survive by a woman who has so far managed to make a living as an artist for 25 years. A Marketable Talent – To run a small business takes many skills, but to make your living as an artist you also must be able to create objects people want to buy. Sorry, it’s a fact. If you don’t have “it” you aren’t going to survive as an independent artist. You might get recognition and that’s great if that’s all you’re looking for, but the bottom line is that your work must sell if you want to elevate what you do beyond being just a hobby. It may be beautiful or controversial or eye-catching, but it also must have that magic something to which people respond, that creates desire in them, that brings them joy or fills a need. The reaction can be very subtle and complex. It is not like you can embed the words “BUY ME” as a subliminal message in a border print or tell people they should buy your work. They have to want to own it. It would be wonderful to just design whatever you wanted with no care as to whether or not it would sell. But unless you’ve already you made your money in another field and are happy to blow it on self-expression (not that there is anything wrong with that – I’m just trying to be practical here), you really have to consider who you imagine buying your work. Would you buy it? Would you spend that much on it? Could you imagine giving it to someone you know as a gift? Not to say there is only one message or one target group. The wonderful aspect of art is that there is a message for every type of person out there. You just have to think about who your target market is and whether that group is large enough or has enough disposable income to support the arts. You need a talent as a designer that appeals to this target group, or at least to enough people that you can eek out a livelihood. Remember, you have to approach this as a business – it is just one of fundamentals. What if you are designing artwork that you personally could not afford to buy? You have to imagine the type of art patron who would be interested in it. Will this appeal to them? Is it an exceptional piece of art? Is it making a statement that a wealthy supporter of the arts would endorse? Is there a compelling story behind it? Will the colors mesh with a patron’s decor? I used to design large silk wall graphics, but they tended to be too colorful, too bold. The more subdued colors sold best, but were not my favorites to design. I eventually moved away from designing large scale pieces and instead concentrated on smaller gift pieces that retained the bold and colorful feel of my silk paintings. My approach now is to create beautiful functional art. So many of the items I have designed came about as a direct result of something I personally needed. I had business cards but couldn’t find a case for them that I liked. Back then (remember, I’ve been at this for 25 years now), most cases were either plain or designed for men. With the increasing presence of women in important positions in business came the need for business card holders with a more feminine look. Mind you, still distinctive and professional but without looking like it was bought at a men’s store or swiped from a husband or boyfriend. Cases with a sense of style, a beautiful, personal fashion accessory customized to suit one’s tastes. Another example is night lights, which I started designing when I was pregnant with Parker, now 11. Any women who has experienced it knows how often you get up at night during pregnancy. (Of course that was nothing compared to how much I was up after she was born!) Nothing I had seen was quite the right style and was always the wrong color, so I developed my line of etched metal night lights to be strong on design yet still allow customization (select a design you like, tell me what metal finish you need to match your hardware then pick the color matches the rest of your decor.) Anyway, I was sure happy to have my night lights so I didn’t have to stubble around! Also gave me something visually interesting to look up at when my neck got stiff from looking down at my baby while nursing or trying to rock her to sleep. So again, these are just my thoughts and my approach as a mom and an artist to a diverse, creative and wonderful way to live and work. For all you ladybug collectors, here’s a new way to appreciate your favorite little insect. Researchers analyzing the chemical composition of odors have discovered the chemical Harmonia axyridis in wine. This bad-smelling liquid produced by ladybugs has been tainting the taste of wines. This is now being called “ladybug taint.” The ladybugs release this smelly chemical as a defense mechanism, but unfortunately, the human nose is sensitive to even small amounts of it. Ladybugs, the well-known friend of gardeners, have been rapidly increasing in population in the Midwest as aphid populations expand. As a result, vintners are reporting that more and more of these insects are getting caught up in the harvesting process by accident. As increasing quantities of wine is affected, more consumers are drinking this “ladybug wine.” While wine has been shown to have many health benefits including reducing the risk for cardiovascular disease, this new twist makes it a little less appealing. But for all you ladybug lovers who would prefer just to decorate with these cute bugs, we have a beautiful selection of gifts and decor the Kyle Design Ladybug Gifts page. You’ll find the fun Ladybug Christmas Ornament shown above as well as business card holders, magnets, night lights and more. For the cool Wine Pill Box at right, please visit our Wine and Grapes Gifts page. A French bullet train hit a new speed record for travel on conventional tracks this week. The V150 train hit 357.2 miles per hour, which is as fast as an airplane without actually taking flight. Thank goodness the trip goes quickly, because at these speeds images outside the train window become just a blur. No entertainment value there. You just get to sit back and focus on how fast your heart is beating and wonder which is likely to occur first – arrival at the station or a massive stress-induce heart attack. Alstom Transports, who built the train, had been hoping to beat the 361 mph record set in 2003 by one of Japan’s magnetically levitated bullet trains. The track and the engine were both modified for this attempt at the speed record, but the company actually has no plans to implement these changes for their standard trains. They do hope to land some contracts with China, which is planning to build 7,500 miles of high-speed railways in the coming years. Compare these speeds to the all-time speed record of a conventional locomotive. This was set by an LNER Class A4 4-6-2 Pacific steam train in the United Kingdom. On July 3, 1938, it reached 126 mph on a slight downhill gradient down Stoke Bank. Typically, steam trains ran at less than the 70 m.p.h. track speed limits. There are many great sites out there compiled by train buffs that detail all the facts about these magnificent machines. If you’re interested instead in a gift for one of these train buffs, then be sure to check our the Kyle Design Train Gifts page. The skeleton of a prehistoric whale was excavated in Tuscany this week by Italian archaeologists. It was found surrounded by a huge array of fossilized fish and shells. Researchers believe these hungry organisms lived off the whale’s decomposing body for decades! They are still trying to determine whether the 4-million-year old whale was killed by a shark as there were shark teeth nearby as well. Long ago, this area of Italy had been under warm waters. Fossils of sea life are regularly found, however seldom in such good condition as this nearly perfect specimen. The waters began receding about 1.5 million years ago leaving the lush vegetation and rolling hills found in the gorgeous Tuscan countryside of today. The decorative night light above features whales swimming in a sea of iridescent blue glass. For more unique whale themed decor and gift ideas, please visit Kyle Design Whale Gifts. The Nationwide Tour’s Livermore Valley Wine Country Championship was held this weekend at the Wente Vineyards here in Livermore, CA. This golf event is a great opportunity to show off the beautiful gateway and surrounding areas. This event could be renamed the Tough Love Golf Tournament because it is such a tough course to play but everyone loves the stunning location. How tough is it? For the week, the course played to a stroke average of 75.235 which was the highest on the tour in five years. The Wente course is considered the hardest on the Nationwide Tour, but I wouldn’t be surprised if Livermore’s famous wind had something to do with these scores as well. The tournament was won by Omar Uresti despite a double bogey on the final hole. Talk about winning ugly! Uresti could easily pay homage to the tough part of the event with a contemporary Winds Business Card Holder. Alternately, he could celebrate by stashing some of his winnings into an artistic Wine Money Clip and just focus on the part that everyone who attends loves – the juxtaposition of the rolling oak tree dotted hills and the patterned rows of wines vines under warm, sunny skies. For an enjoyable yet challenging combination of wind, wine and winning, then the Wente tournament is the event to attend. This is the time of year that many religions celebrate important dates on their religious calendars. It is a time of reflection. The Islamic holiday Mawlid marks the birthday of the Prophet Muhammad, the founder of Islam. It is celebrated by most, but not all, sects. It falls on the 12th day of the Islamic month of Rabi al-Awwal. This year it began on Friday night and lasted through Saturday. For Muslims, Mawlid is the occasion to share food and charity, decorate homes and mosques and to recite stories of Muhammad’s life. These activities act as reminders for Muslims to follow the teachings of Muhammad and to practice them in everyday life. Christians celebrated Palm Sunday, the day that Jesus arrived in Jerusalem greeted by followers waving palms. Good Friday and Easter come later this week. Easter Sunday marks the day of the resurrection of Jesus which occurred on the third day after his death on the cross. Jews will celebrate Passover starting Monday at sundown. Passover is an eight day holiday commemorating the Exodus of the Israelites from ancient Egypt and their new found freedom. Passover has been celebrated for over 3300 years. Matzo, an unleavened bread, is a symbol of Passover and is eaten by Jews during this celebration.